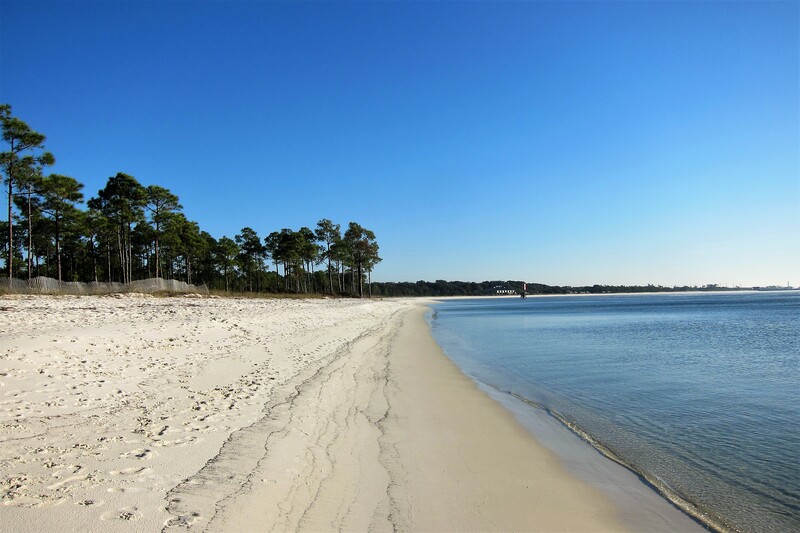 Tuesday, December 5 through Friday, December 8, 2017-Pensacola, Florida: We love waking to sunlight streaming through the window while camped beachside on the shores of Pensacola Bay. As Kit rolled over for some well-deserved late sleepers, I quickly dressed, grabbed my camera, and walked across the dunes by way of the boardwalk which protects the delicate coastal grasses. The beach was deserted at this ridiculous hour except for this other stick-in-the-mud! The morning chill sent me back to the warm camper, where Kit was rising to meet the day. 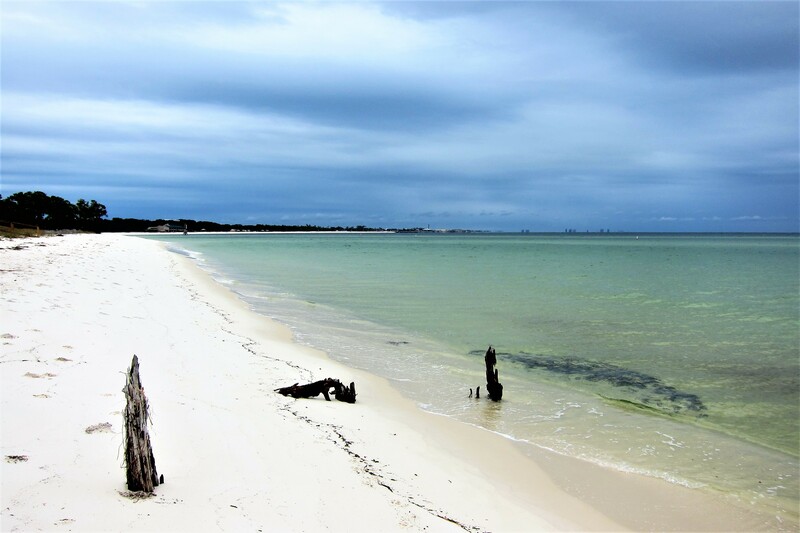 Pensacola, Florida has become a traditional stop for us over the years…it features a nice RV Park on the Naval Air Station, and a great opportunity to rest, recreate, resupply, and prepare for the trip west. In addition, Kit likes the idea that there are plenty of attractions within walking distance to keep me occupied so she can enjoy some peace and quiet! 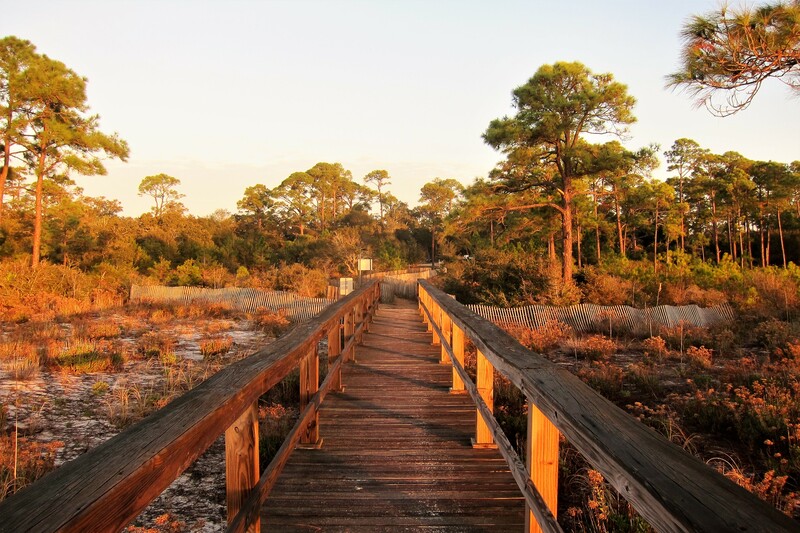 So, one of the mornings, I took a stroll along the walking path that parallels the bay. 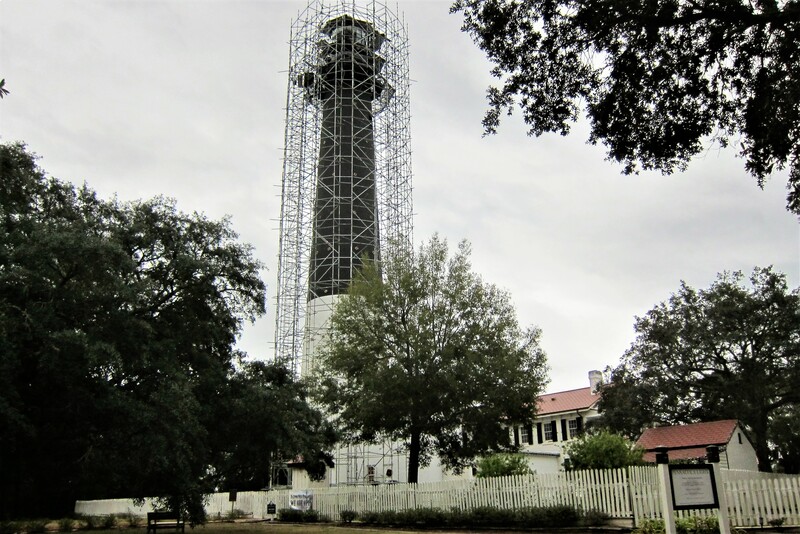 Which led me to the Pensacola Light Station, where I found the tower shrouded in scaffolding. We have visited this light station many times in the past, but this is the first time I have seen it undergoing restoration. The First-order Fresnel lens has been removed for repair so the light on this navigation aid has been extinguished…for the first time since the civil war! Back at the camper, I joined Kit for lunch and we made a list of things to accomplish during our stay…one of which was to visit some old friends from Maine. 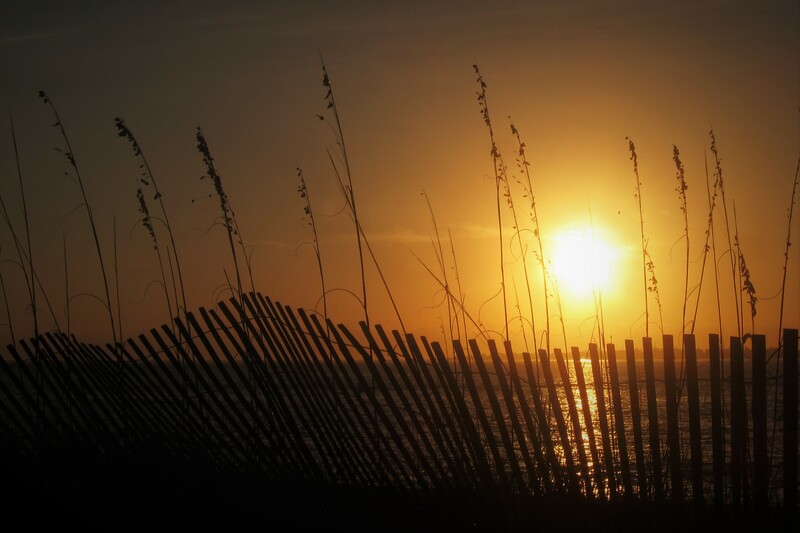 There are many retirees living in Florida, and Pensacola is no exception, especially military retirees. A former shipmate of mine and his wife reside in the area, so we invited them by to visit. Ray and Trini spent many years residing on Maine’s Sabattus Pond before moving south. Ray and I were stationed on the same US Navy ship back in the 1970’s…the USS Donald B. Beary. A Knox Class Frigate out of Norfolk, the Beary has the unique distinction of sailing in the Atlantic, Mediterranean, Red Sea, Arabian Sea, Indian Ocean and the North Sea…all in one 7-month cruise! This unusual accomplishment was brought about by trouble in the Indian Ocean where we were sent from our regular Mediterranean deployment. The Beary was dispatched to transit the Suez Canal and support our allies, including the Shah of Iran…boy have times changed in that region! 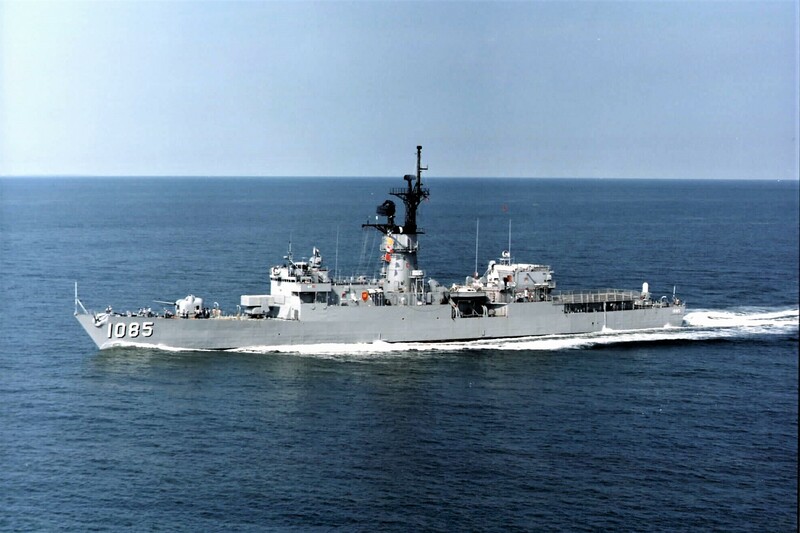 Arriving back home, she was scheduled for a one-year baseline overhaul at Bath Iron Works in Maine where, following retirement from the Navy, Ray and I eventually settled and worked at the shipyard. 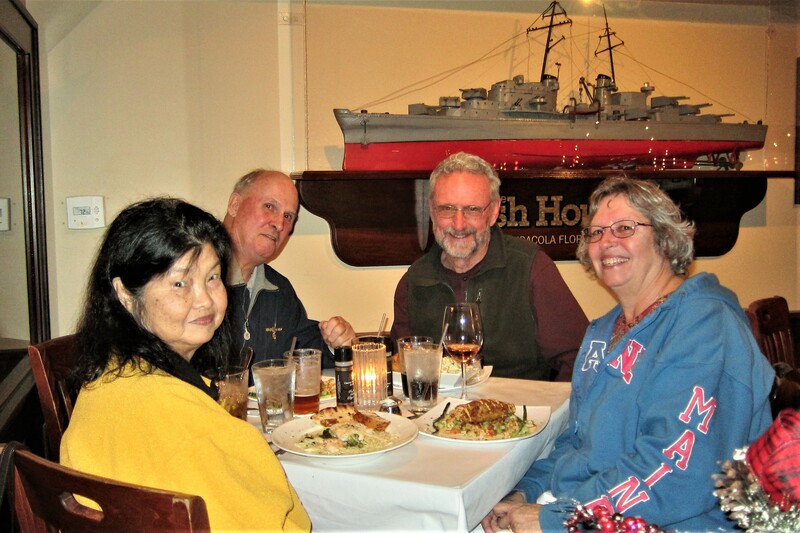 Ray and Trini treated us to a very nice meal at one of their favorite seafood places…The Fish House located on the waterfront of Pensacola Bay. 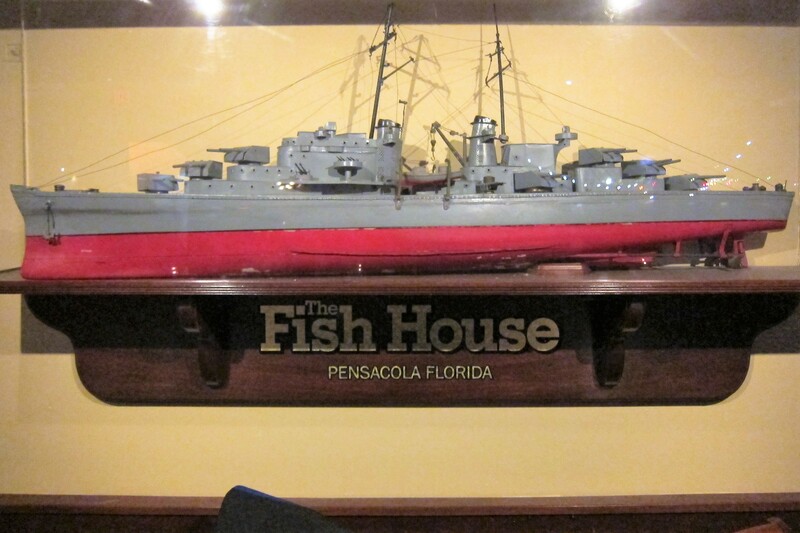 It somehow seemed appropriate that the staff sat us in an alcove dominated by a model of a US Navy Battleship. 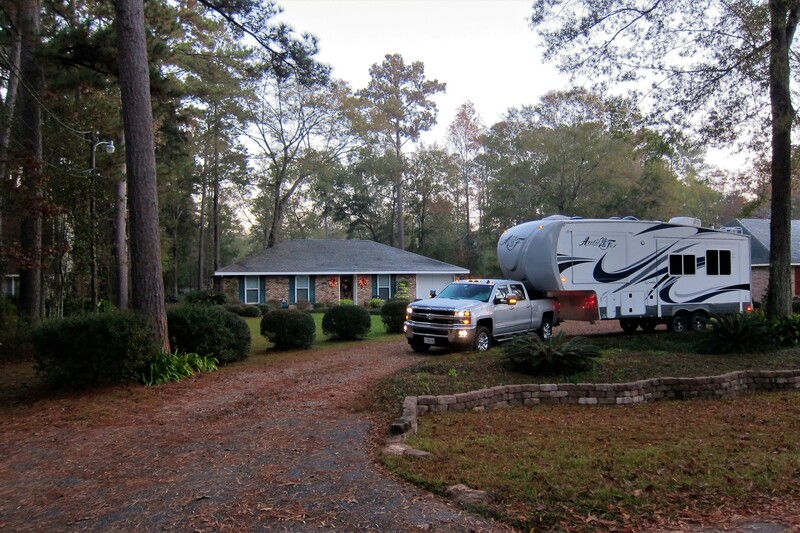 It was great reconnecting with them and seeing their beautiful new home in Pensacola…thanks guys for the hospitality! 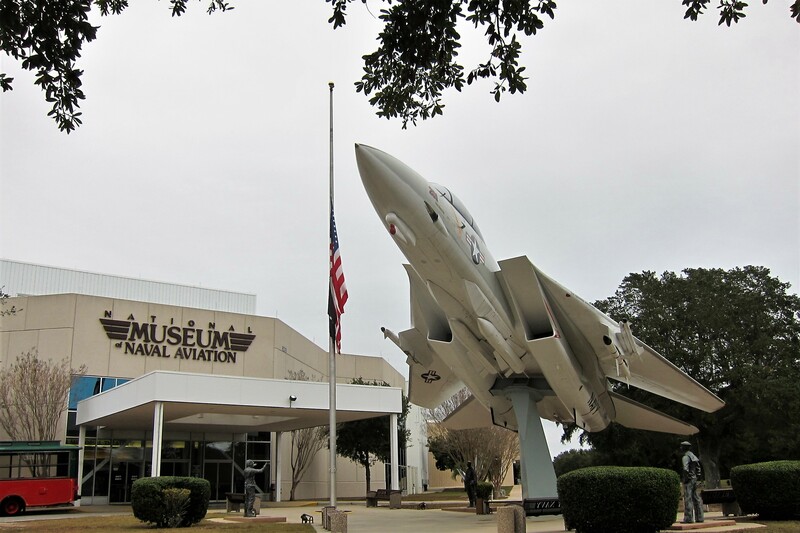 Another attraction that we visit frequently is the National Naval Aviation Museum, located a mile up the road from the campground. Even though I have enjoyed this premier repository of military history dozens of times, I always want to return as it is impossible to view all the displays and read all the material in a few visits. In addition, the museum is constantly adding to their collection or holding special events, such as this tribute to the heroes at Pearl Harbor of December 7, 1941. Today’s ceremony, honoring the remaining veterans was especially poignant as there are so few survivors left to tell their personal stories. 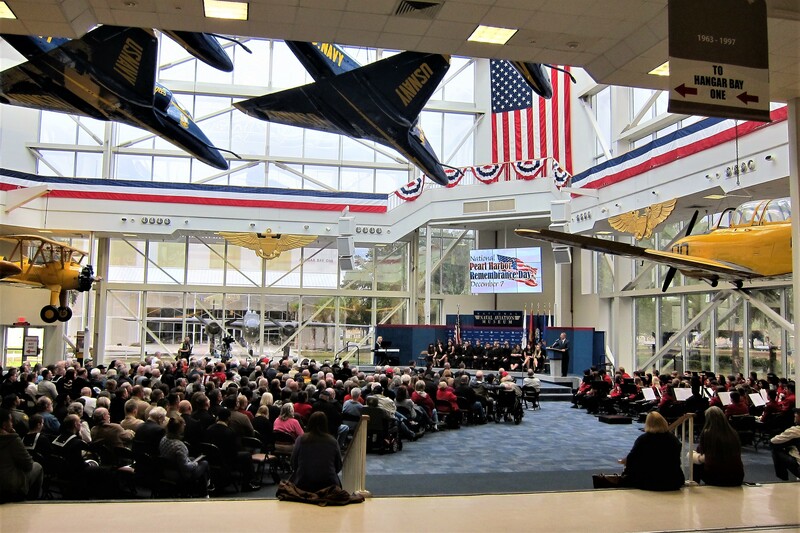 The museum atrium, flanked by historic aircraft, was packed with young and old alike listening in rapt attention to speakers detailing the events on that horrific day of infamy. This day is especially personal to me as my father enlisted in the Navy on his 18th birthday, December 6, 1941…and was on his way to recruit training when the sneak attack unfolded. He later served on a destroyer in the South Pacific during the war. Then, six years after the attack on Pearl Harbor I was born in Kaneohe, in the Territory of Hawaii. 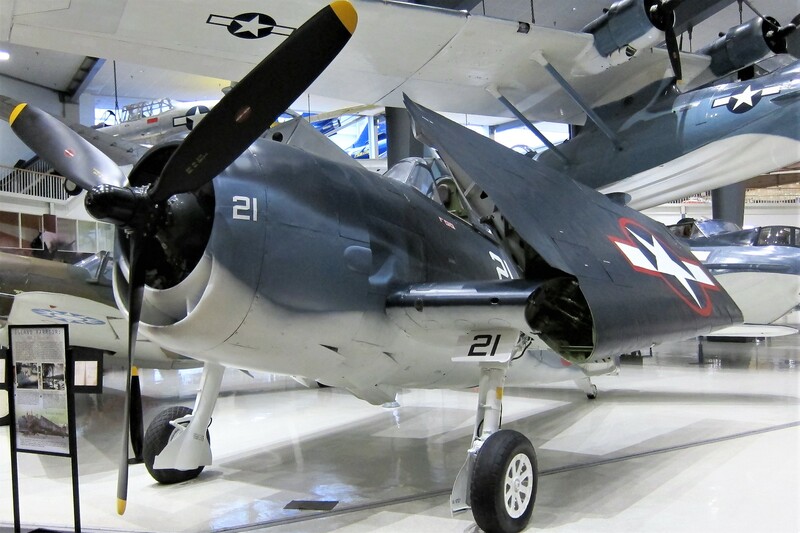 Located on 37 acres with 300,000 square feet of indoor exhibit space, the National Naval Aviation Museum contains over 150 historic aircraft and many other aviation related artifacts from the Navy, Marine Corps, and US Coast Guard. I have attempted to chronical many of these iconic planes during past visits, and this year I focused on the story of the Great Lakes Fleet and its contribution to the war effort. What was the US Navy doing operating on Lake Michigan? 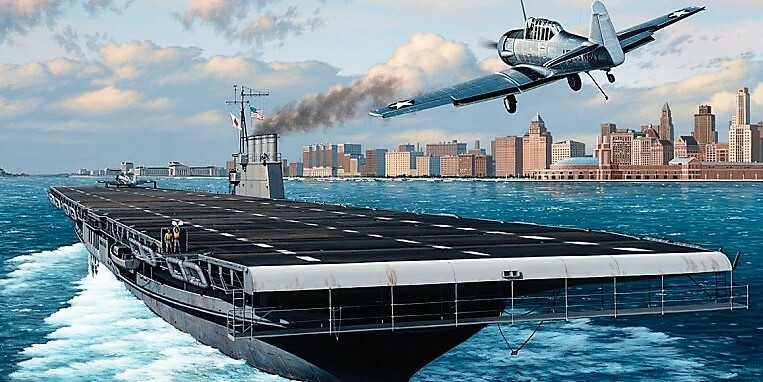 Well, with a two-ocean war raging, and the Navy’s surface ships vulnerable to submarine attack, a safe, calm, and convenient body of water was needed to train new pilots in the art of taking off and landing on an aircraft carrier. So, two coal-fired, side paddlewheel propelled passenger steamers were acquired, fitted with a 500-foot-long flattop deck, and pressed into service. 17,000 pilots, including former president George H. W. Bush, and many more deck operating personnel received their initial carrier qualifications on these ships. But not without incident, as over 100 aircraft were lost during the three years of training on Lake Michigan. Fortunately, most pilots survived these crashes, but the aircraft were lost to the deep and cold fresh water of Lake Michigan…until recently. 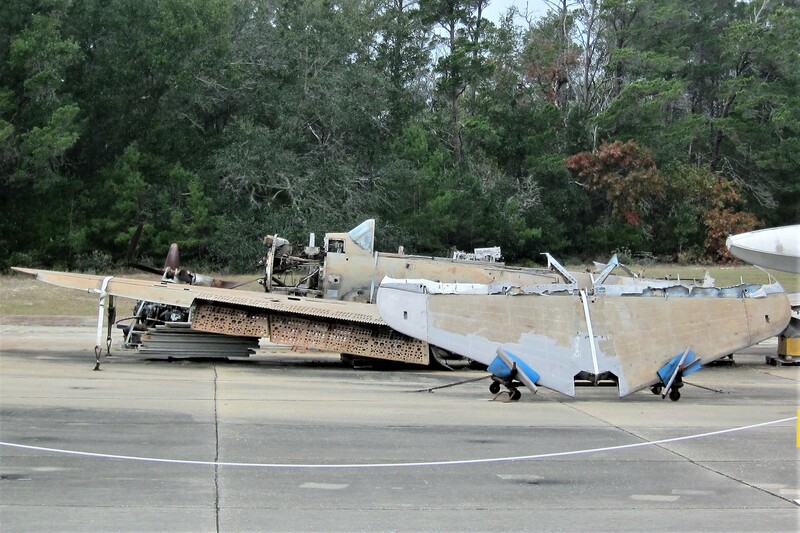 These submerged wrecks remain the property of the US Navy and a concerted effort has been made to retrieve some of the historic planes, including this F-6 Hellcat. 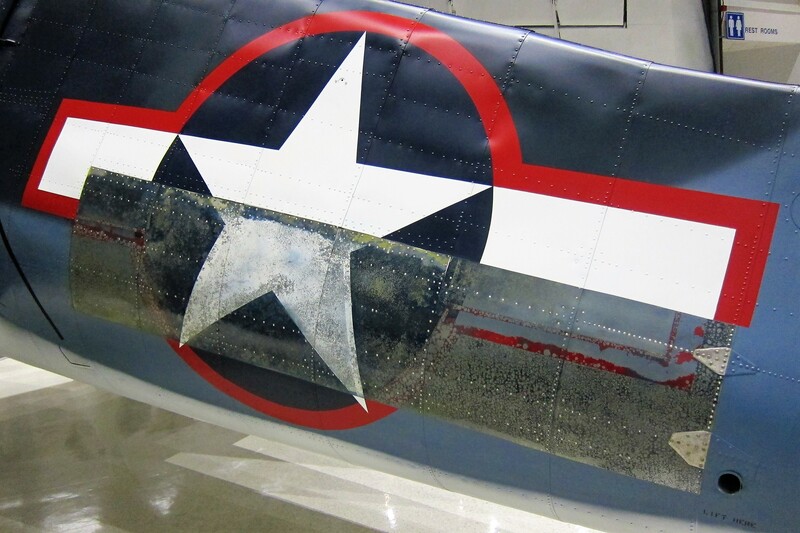 The submerged Hellcat was recovered in 2008 and restored by Naval Aviation Museum volunteers to display worthy condition. A portion of the fuselage was left as found to document the superb condition of the aircraft due to the protective elements of the Great Lakes. During the height of production, Grumman Aircraft Corporation on Long Island, New York turned out one of these planes an hour, around the clock, seven days a week for a total of over 12,000 aircraft constructed during the war! The Hellcat was used extensively in the South Pacific…who knows, this very warplane may have helped protect my father’s destroyer squadron! 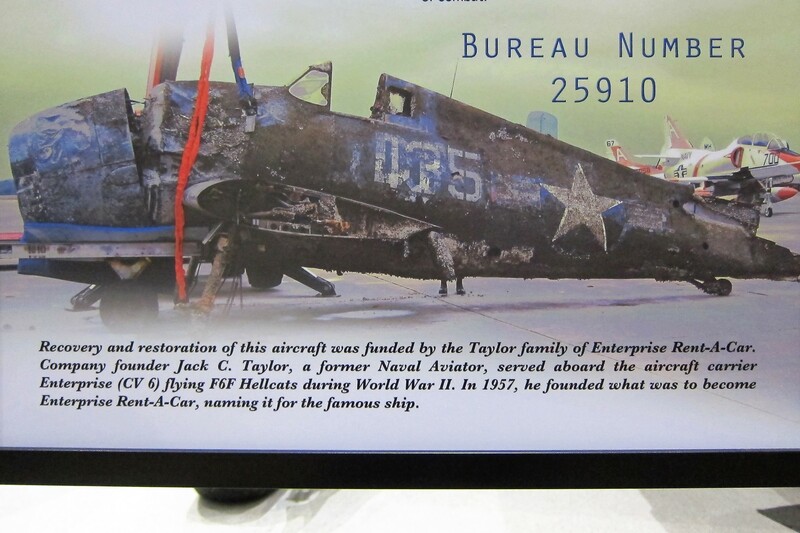 As an interesting side note, the funds for this Hellcat’s recovery and restoration came from Mr. Jack T. Taylor, the founder of Enterprise Rent a Car, who flew the Hellcat during WWII and later named his company after his ship, the USS Enterprise. Another historic aircraft recovered from Lake Michigan, a SB-2 Helldiver, waits in the museums storage yard for its turn at renewal and display. Enjoyed a great day at the National Naval Aviation Museum…if you’re ever in the area I highly recommend visiting this incredible facility. It is free, open to the public, and you will not regret it! 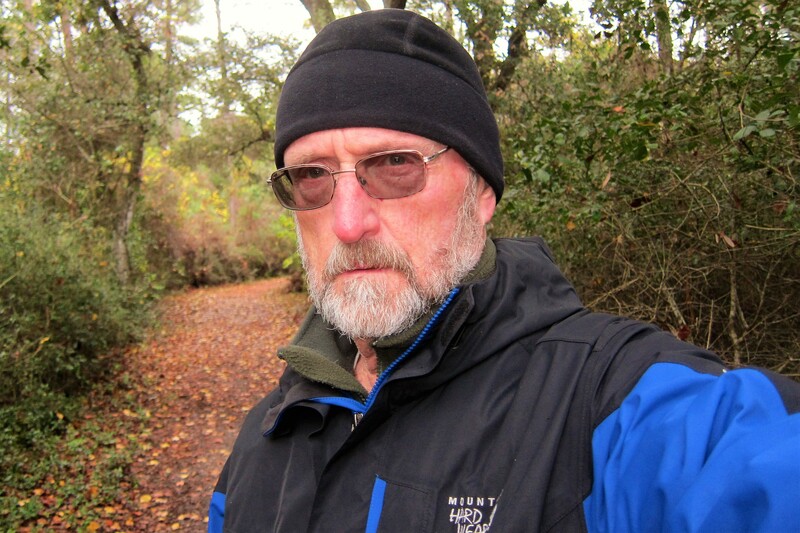 The weather during our stay has been variable…one day sunny and in the 70’s and the next rain with temperatures in the 40’s, but that didn’t keep us from our daily walks provided we were bundled up! Then on those days where Kit needed some space, with me not in it, I would leave her to her Christmas card project and walk the beach…usually bringing a few of my kites along. The sparsely populated and wide sandy beach is normally perfect for high performance kite flying…when there is sufficient wind. But alas, this year that wasn’t to be…so I would just walk along and commune with other birdbrained creatures that were challenging the cold windless environment. And try to figure out what kind of critter would dig down in the sand like this. There were dozens of these symmetrical tubes penetrating the wet sand to a significant depth…all within the tidal zone!?!? 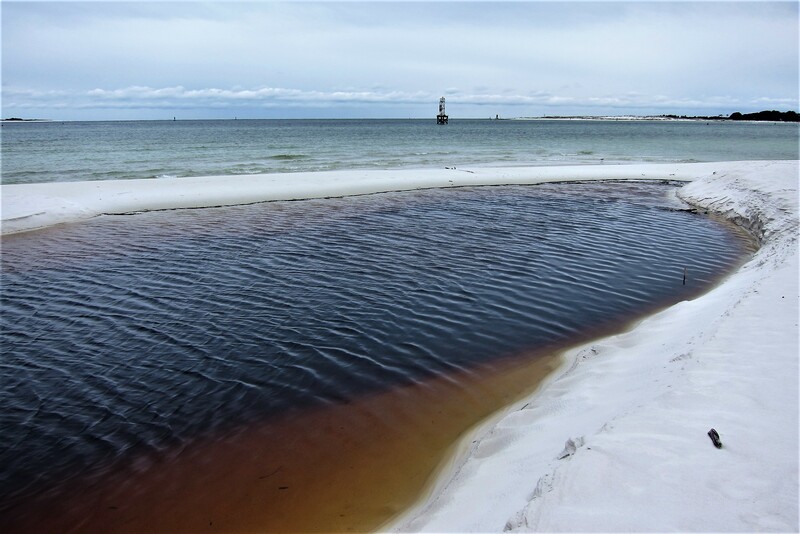 Speaking of tides, when it is out, there are a few pools that contain thousands of minnows darting about. Tried to get a clear photo of them but was in danger of sliding in up to my waist…a real problem as I was few miles from the camper and the temperatures were on the chilly side. Well tomorrow we depart and begin our Western trek…plan is to be in Las Vegas by Christmas to enjoy the holiday with daughter Suzie and her family! Saturday, December 9, 2017: Woke this morning to brilliant sunshine. 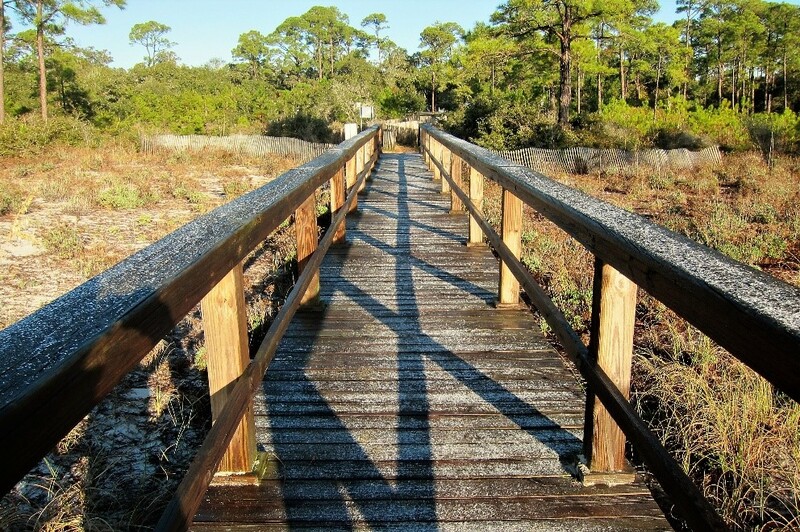 Grabbed coffee and camera then headed across the icy boardwalk. Even though it is departure day, I couldn’t resist a short stroll along the beach this frosty morning. Going to miss this place, even though it has been much colder than normal. 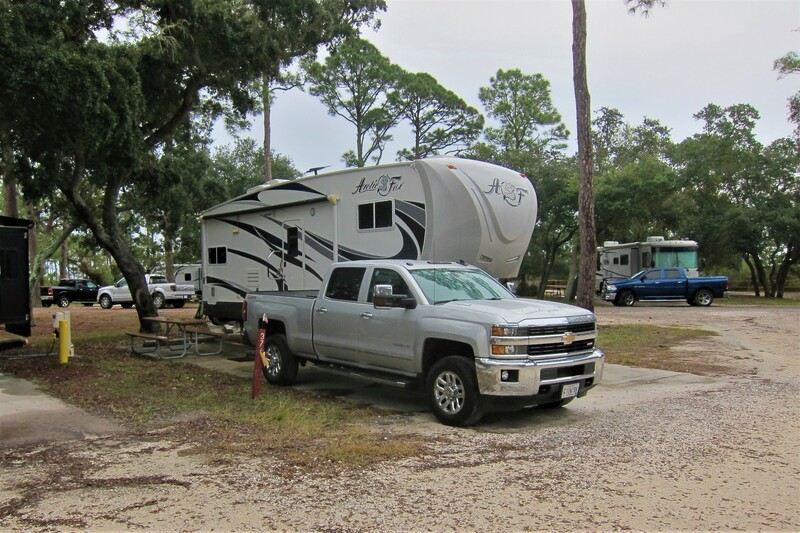 Back at the camper, Kit was stirring…so following a hearty breakfast, we headed out from Oak Grove RV Park on Blue Angel Highway just before 1000 hours. The sun is bright, and the temperature is a balmy 39 degrees. Everyone in the panhandle of Florida has been bundled up and complaining about the severe weather this week. By 1030 we intersected I-10 and headed west…this will be our main artery for the next few weeks for our travels to the left coast. Crossed into Alabama at 1038 than over Mobile Bay on The Jubilee Parkway as downtown Mobile came into view. 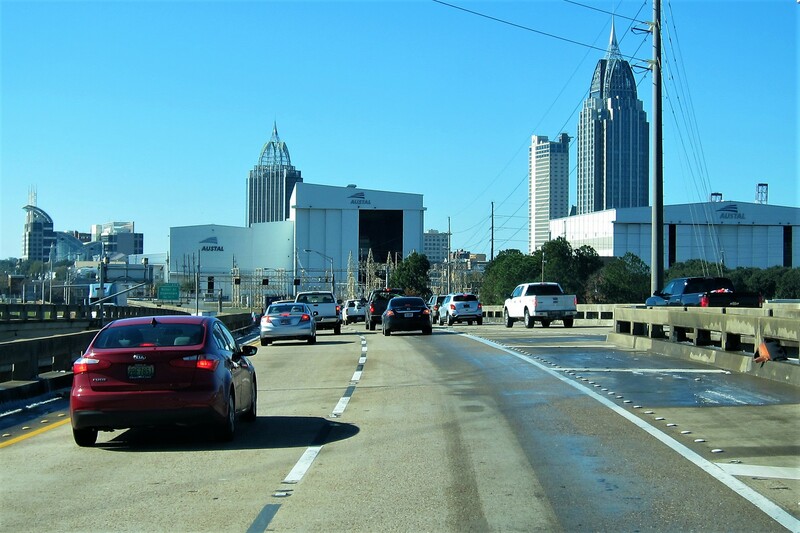 And abruptly dove into the George Wallace Tunnel that takes travelers below downtown and under the Mobile River. Old Axe Handles tunnel was constructed in the early 1970’s by building sections on land, barging them to the site and submerging the tunnel sections to be joined together. 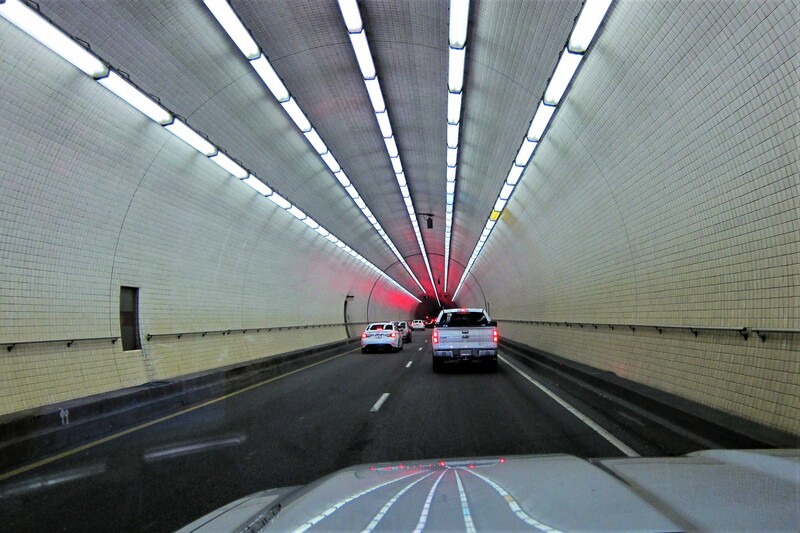 When completed, the tunnel was pumped dry, finished off, and opened for traffic…hopefully in that order. Within 30 minutes we were crossing into Mississippi, and soon noticed the looming cranes of Pascagoula’s Ingalls Shipyard…a competitor to Bath Iron Works. 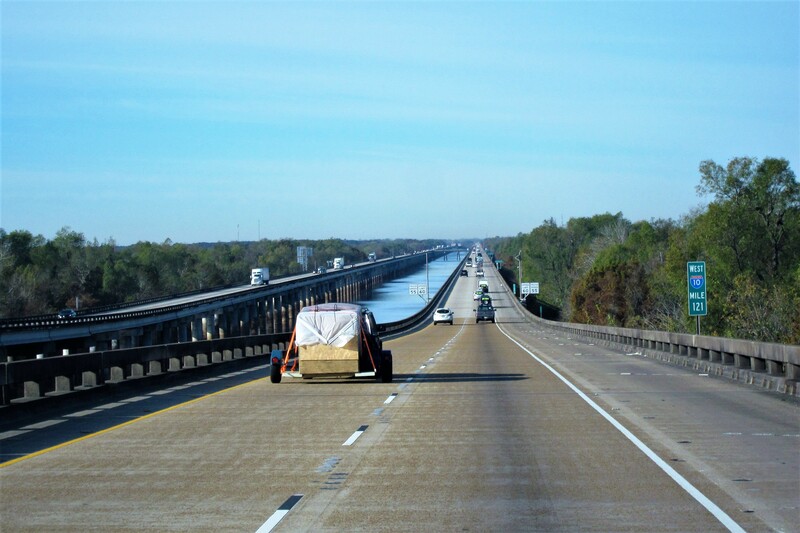 Crossed the Louisiana border at 1431 and shortly after left I-10 to take I-12 which traveled northwest along the shore of Lake Pontchartrain. This route took Kit and I toward the town of Covington, where we pulled into the dooryard of Johnny and Eileen…old Navy friends from our Key West days. After a wonderful time of reconnecting and catching up on each other’s lives, as per our custom, we treated our hosts to a meal at a new place none of us had tried before. New Orleans Style Seafood was a small place with lots of character. 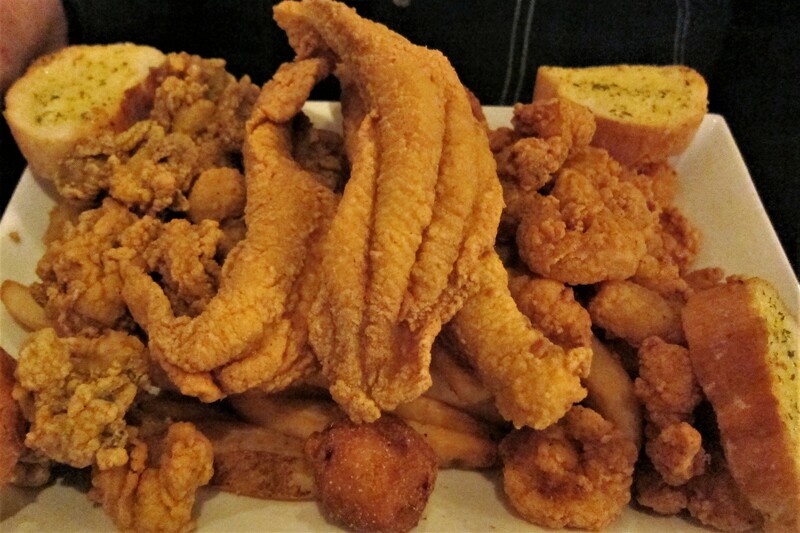 And the fried oysters, shrimp, catfish and hush puppies were outstanding! We all agreed that this is a keeper, and I will go on record as stating that this spot is now my second favorite place for fried seafood on the north shore! Returning to their home, we sat up until late in the evening reminiscing and telling stories about our days as teenage parents on that tiny island off the coast of Cuba. 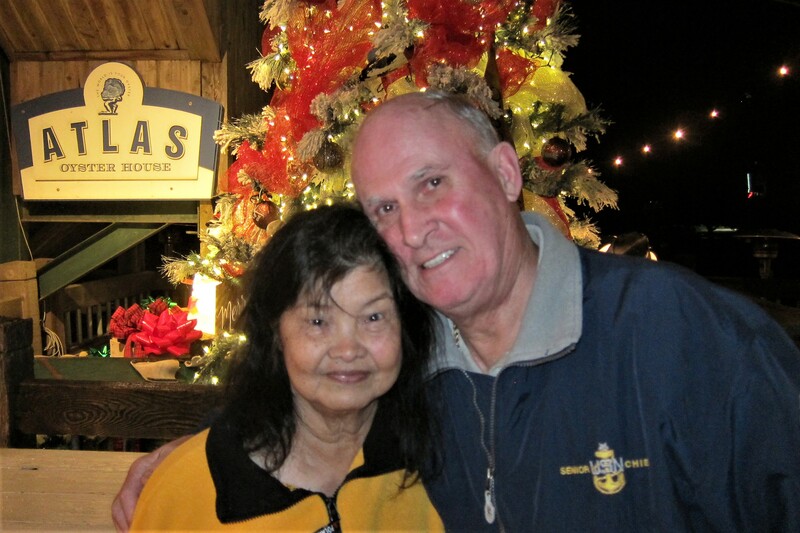 Sunday, December 10, 2017-Covington, Louisiana: A very slow morning unfolded, so following breakfast, I put the finishing touches on the first travel journal of the trip, then asked Kit to review and proofread it, then posted the journal to our website. About 1000 hours there appeared to be life within the house, so Kit and I made our way in to join Johnny and Eileen for coffee. The rest of the day was spent visiting, except for a trip to get one of our 40# propane bottles refilled. What should have been a half hour chore, turned into an hour and a half challenge. To begin with, being a Sunday in this Bible Belt, many places were closed. So off we went to the heathens at U-Haul some 20 miles to the west. Pulling into their yard, I spotted the large propane tank, but alas…they could not dispense any gas due to broken equipment. Then followed a couple of dead ends at places that advertised propane fill stations but, all they had were bottle exchanges. Arrrg…where are the cowboys on Blazing Saddles when you’re in dire need of gas! Finally gave up and as we meandered back, traveling through the countryside, I spotted a propane fill station at an ACE Hardware store, a quick U-turn and pulling up to the bulk tank only to discover the store had closed 10 minutes ago!?!? Oh well, we have the other 40# tank so we won’t be in extremis. Eileen, a native New Orleans girl, makes some incredible Cajun dishes and tonight was a special treat. Her sausage and chicken Gumbo was incredible and was devoured before I could snap a photo of it, but take it from me…it looked as good as it tasted! Following dinner, we enjoyed some more visiting before, saying our goodbyes and turning in…plan is to depart at 0700 in the morning, we’ll see if that happens! Monday, December 11, 2017: Well, we didn’t make it at 0700, we actually departed at 0650! 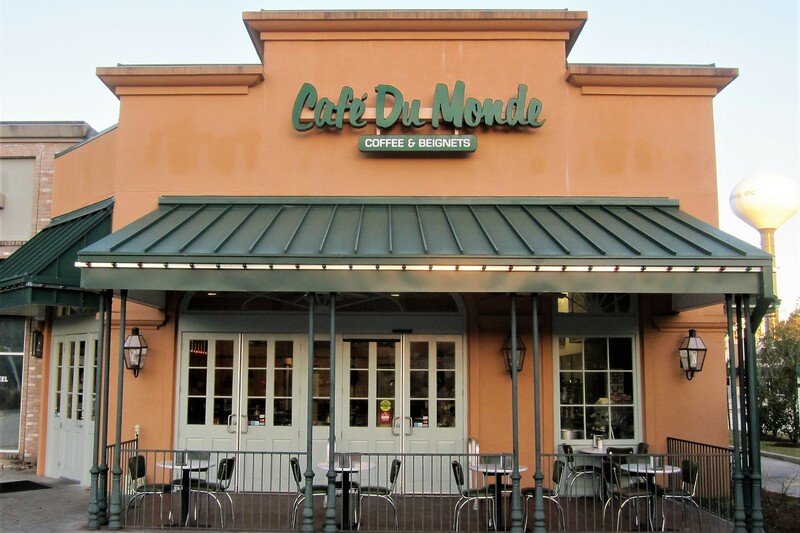 A quick stop at Café Du Monde is a tradition when in Louisiana and today was no exception. 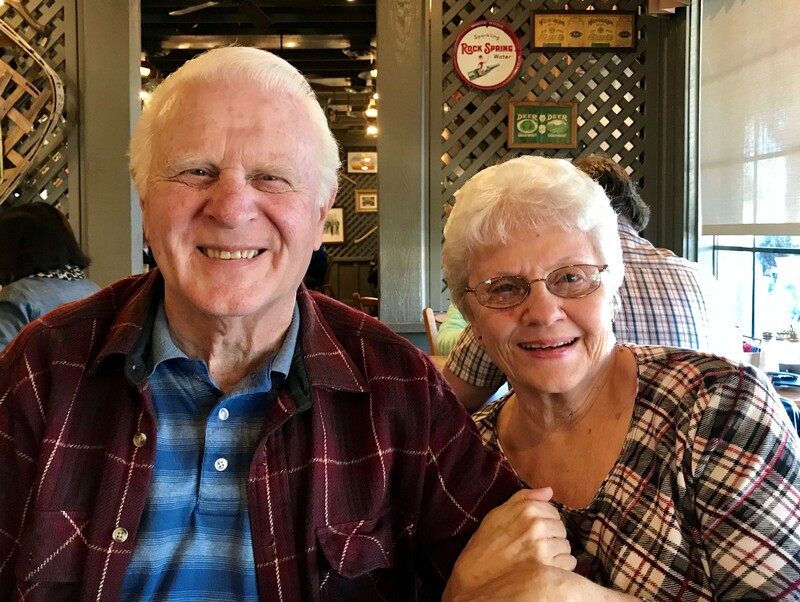 Filling our travel mugs with Chicory coffee and grabbing a bag of fresh Beignets, Kit and I pulled out on I-12 to continue the loop back to I-10…and soon were crossing the Atchafalaya Swamp, the largest wetland in the United States. 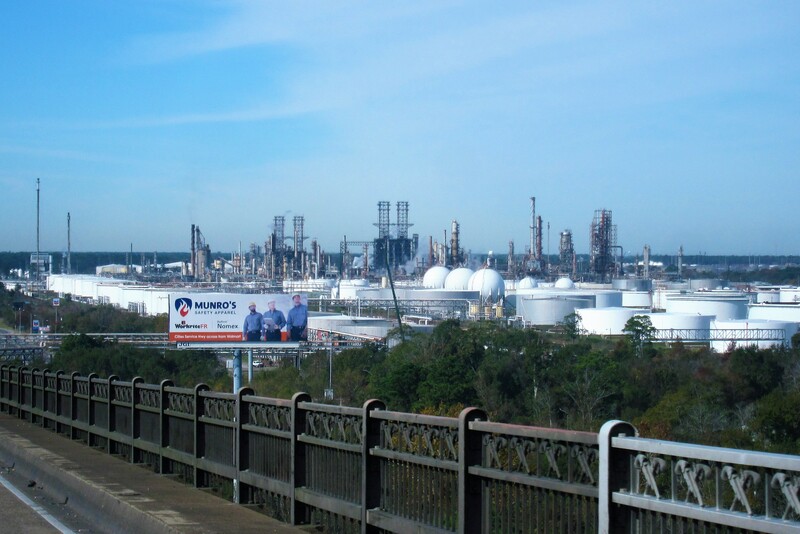 By 0820 we were passing over the Mississippi river at Baton Rouge, and noticed the massive Exxon Mobile refinery. The fourth largest oil refinery in the US, this mammoth facility is capable of processing over 21,000,000 gallons a day. And, at the main gate, there lies an Exxon gas station…wonder if they give free samples? Made a quick stop at a roadside rest area for breakfast around 0900 then, two hours later we were crossing the Texas border. Following a few more rest stops we threaded our way through the megalopolis of Houston and noticed the temperature had risen to very nice 77 degrees. 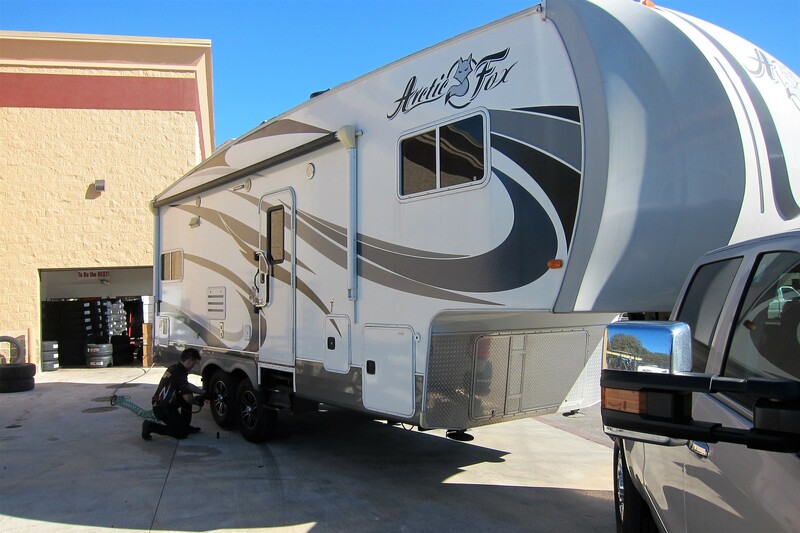 One discovers some interesting vehicles while on a road trip…such as this rather large truck and trailer. Nope, it’s not a military asset…at least not anymore. 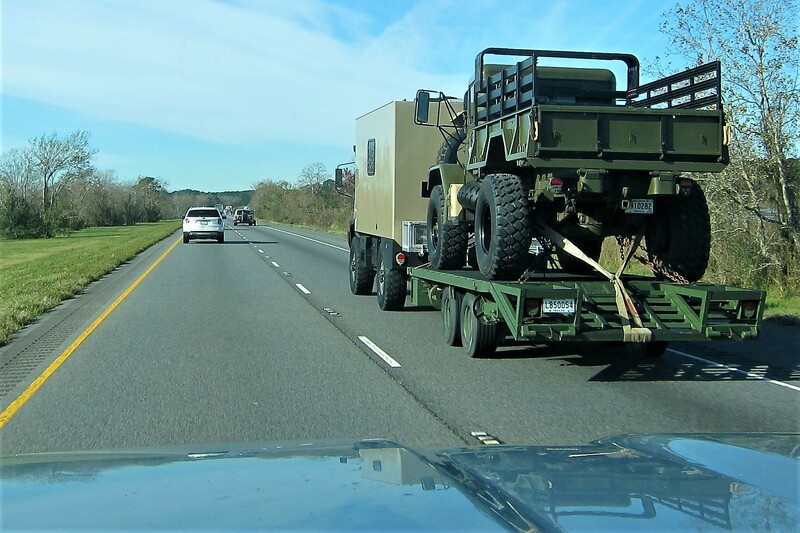 The rig had Louisiana license plates and the 4X4 truck towing the trailer with a restored military vehicle onboard had been converted into an RV…pretty impressive! Much of the westward trek of these trips are basically miles and miles of miles of miles. Many times over the past ten years Kit and I have deviated from the asphalt ribbon of Interstate 10 and explored much of the surrounding terrain. A few times we have chosen to drive US-90 West enjoying the many small towns along the way. However, since we want to be in Vegas by Christmas, we need to plod along at a steady rate. Soon, the sun was low on the horizon, and since we had been on the road for nine hours, Kit started looking for a place to stop for the evening. 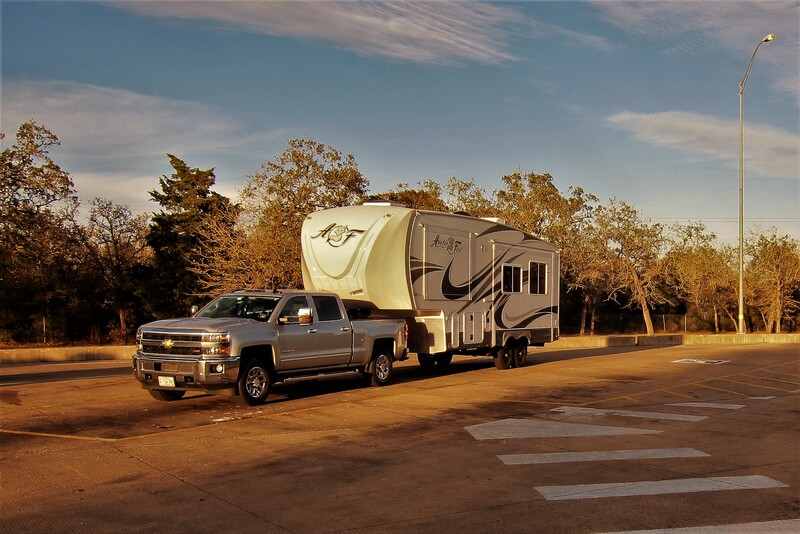 Many states allow overnight breaks at their interstate rest areas, and Texas is no exception. So, pulling into a facility at mile marker 689 shortly after 1600 hours, we pulled in for the evening. Thursday, December 12, 2017: Woke early after a restful evening. Taking a walk about the rest area, we noticed a few other RV’s spent the night as well as a larger number of long haul trucks. Skipping breakfast, we filled our mugs with freshly brewed coffee and hit the road by 0720. Our goal for today is to meet up with some RV’ing friends from Maine for a mid-morning breakfast. Back on I-10 West, Kit and I crossed over Woman Hollering Creek (need to look that up!) and headed for San Antonio. 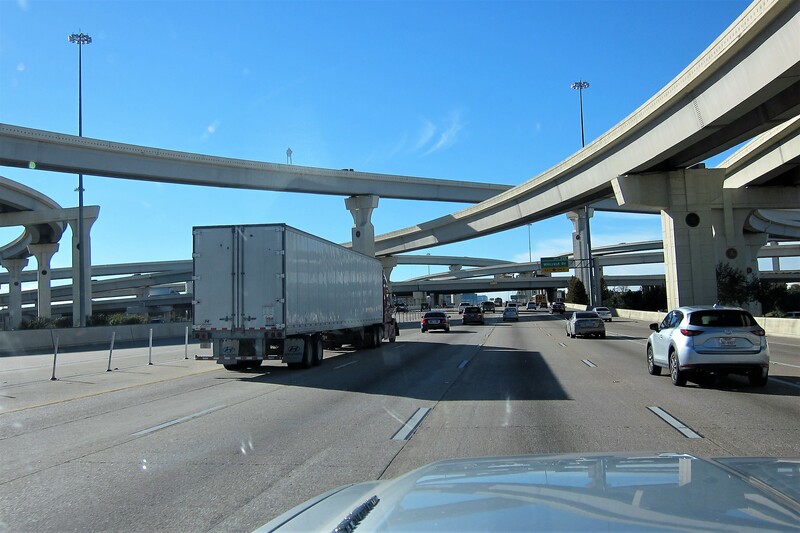 Generally, we take the various loops around this large Texas city, but this morning I took the chance that traffic would be light…and I was correct, relatively speaking. 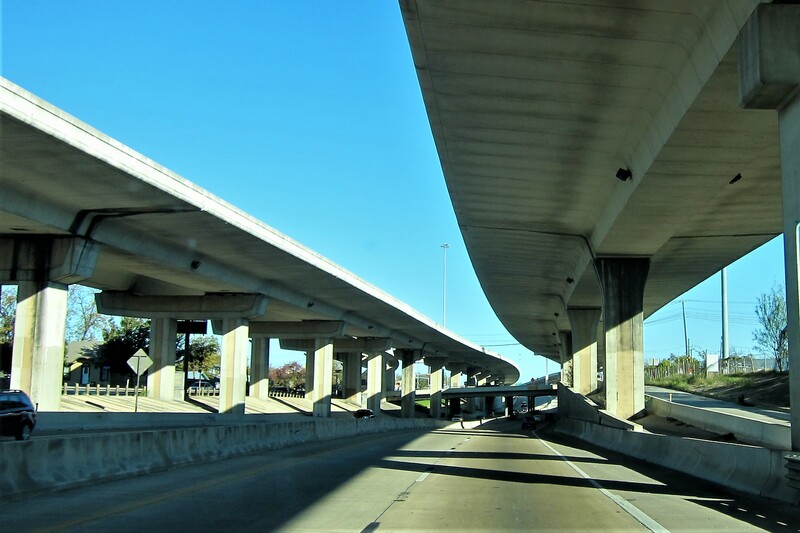 Downtown San Antonio has a unique solution to adding Interstate lanes in a congested area…they just stack the additional lanes on top of the existing ones. If you’re on the upper level of I-10, you become an express traveler, as there are few opportunities to exit the freeway, at least in one piece. At 0940, Kit and I pulled into a Cracker Barrel restaurant just off I-10 which features parking for Busses and RV’s. 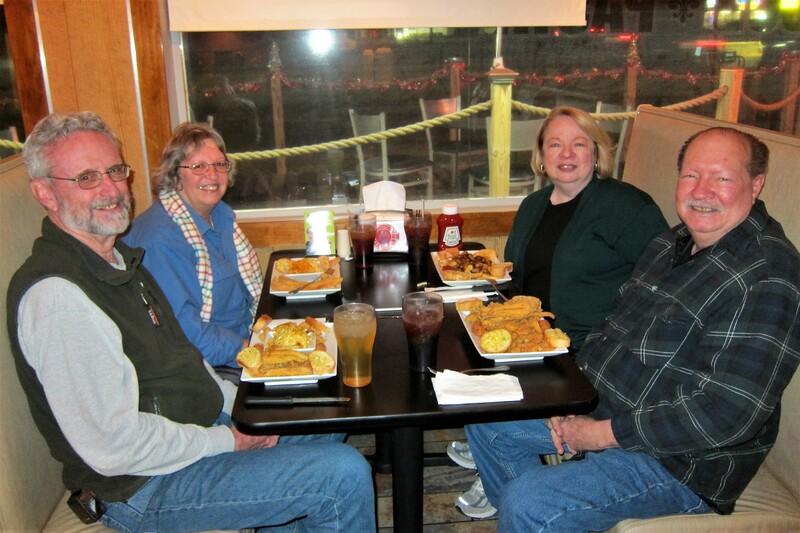 Within minutes, Ray and Darlene arrived and we went in to enjoy some good food and great conversation. During the summer, these two fine folks travel to Maine as they have family and friends in the area. Consequently, we meet up, usually with mutual friends Don and Jane, a few times a year. 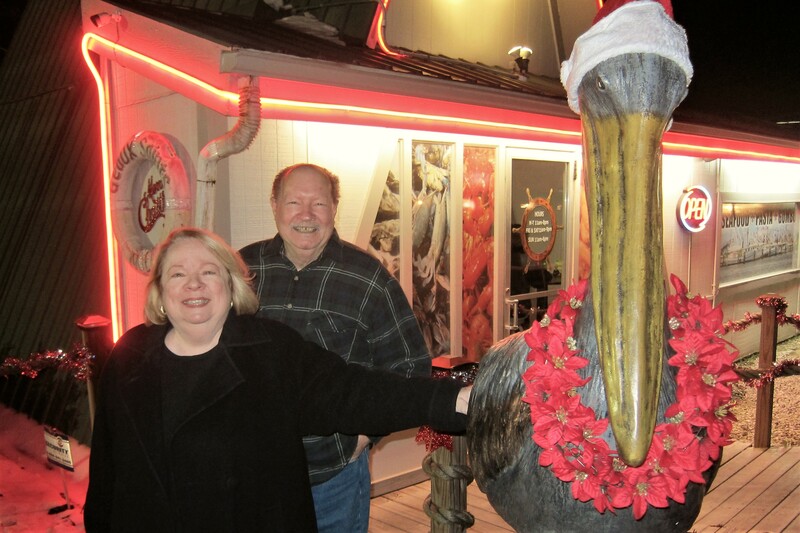 Kit and I enjoy their company and much of the time visiting revolves around RV travel experiences. Saying our goodbyes, we were back on the road by noon. Earlier, during my daily safety check of the rig, I noticed a suspect tire on the camper that I had been watching was getting a bit worse. The tire in question is the last original one on the rig, as the other three had been replaced previously due to various mishaps. So, since San Antonio would likely be the last large city we would be near for a few days, I decided it would be prudent to replace it. So, after calling ahead, we pulled into a Discount Tire franchise where they were ready with the new tire and quickly swapped it out. I like to use Discount Tire while on the road as their coast to coast network and superb customer service is important to me when tire problems arise in who knows where. 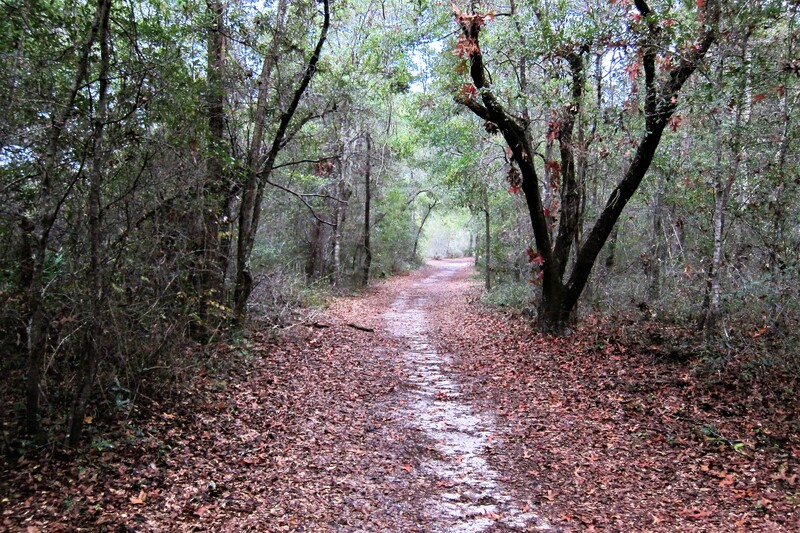 Back on the road, Kit and I decided to head for South Llano River State Park for a bit of R&R. 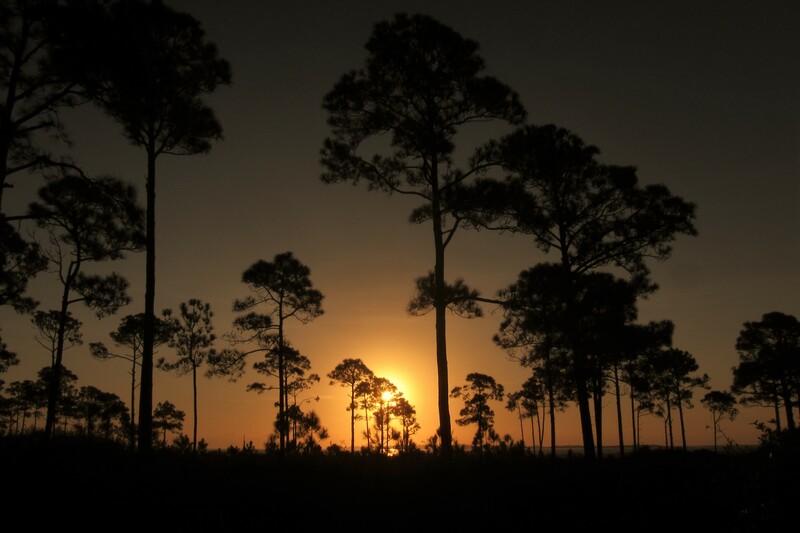 During these long periods of back to back travel days we like to take a down day to relax, and what better place to accomplish that then in a wilderness park? Well, that’s it for this episode…stay tuned for further adventures on the road. Kit’s Bit’s: So far, our trip this year has been smooth and easy. The highlights have been visiting with friends Debbie & Sam, Ray & Trini, Johnny & Eileen and Ray & Darlene. Its always nice to see all of them and catch up on all their doings. Now that we’re back out in the desert and, can see the surrounding area for miles and miles and miles I’m looking forward to seeing family in Tucson and of course, Las Vegas. We’ve been texting with our two youngest Grandboys and they are eager to see us as we are to see them! Hang in there, guys, we’re almost there! This entry was posted in 2018 Excellent Adventure, Uncategorized. Bookmark the permalink. 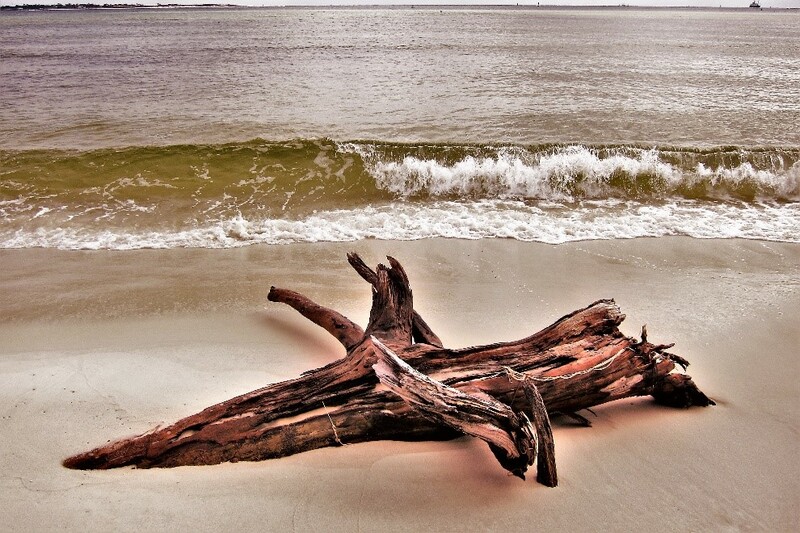 PLEASE RETURN AND PICK UP THAT PIECE OF DRIFTWOOD, DELIVER TO 419 BROWN’S POINT RD!! !! 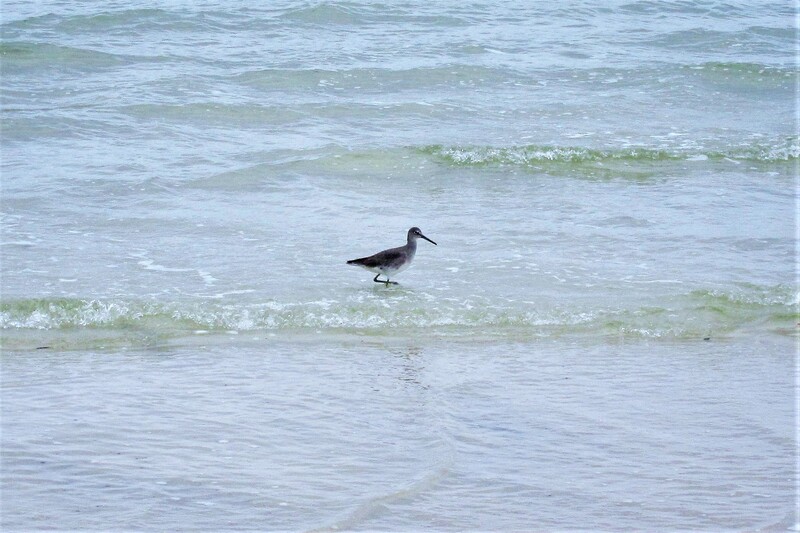 I THINK THE SHORE BIRD IS A YELLOW LEGS!! PLEASE DO NOT SEND PICTURES OF SEAFOOD PLATES, WE ARE TRYING TO DIET!! 3/6 INCHES OF SNOW PREDICTED HERE TODAY AND TOMORRA!! 12/22/2017 QUITE CHILLY AND THE SMELTING COLONIES ARE OPENING THIS WEEKEND. Beautiful pictures! 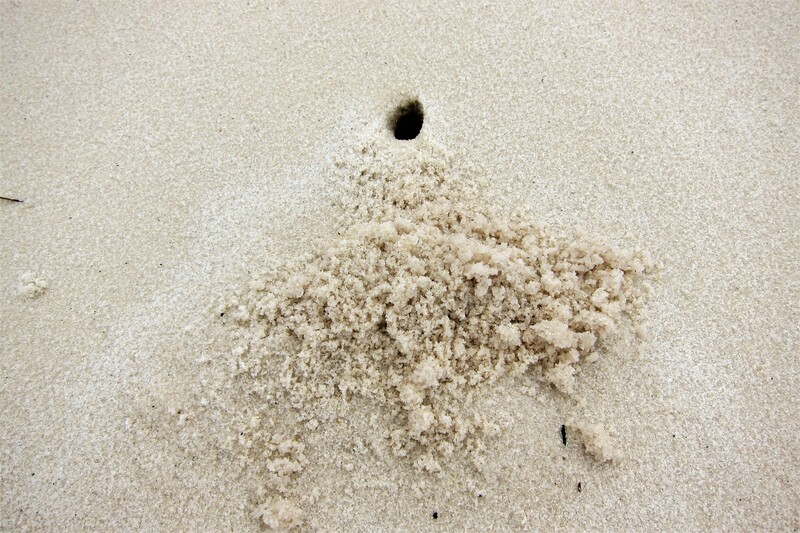 Wonder what made those beach holes though? VERY cold weather coming this week. Single digits, might have to actually don a hat! Take care, drive careful! 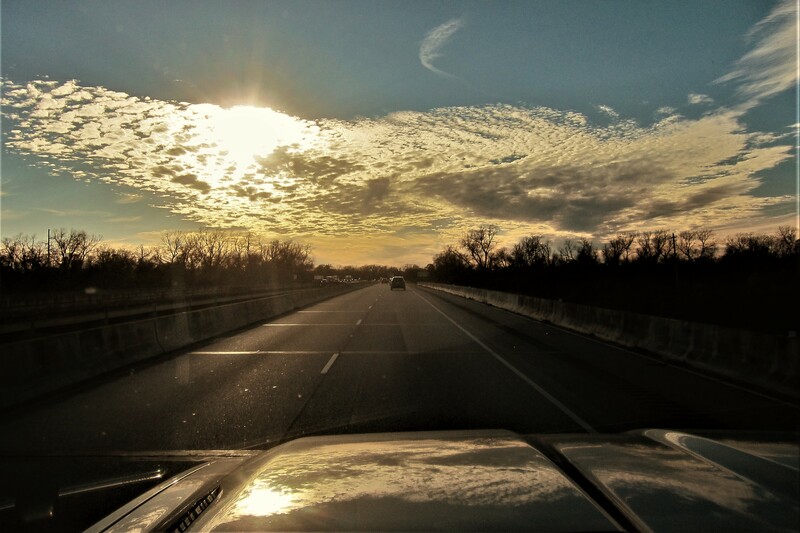 Love your pics……hope you had a good Christmas safe travels on your continued journey west….